There were 256 press releases posted in the last 24 hours and 153,513 in the last 365 days. 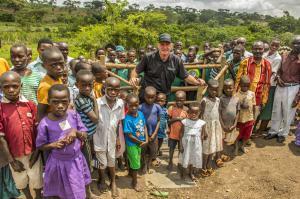 UGANDA, AFRICA, June 29, 2018 /EINPresswire.com/ -- Leaders from the Southern California-based nonprofit Wells of Life made a historic trip to Uganda earlier this spring resulting in an official partnership between Wells of Life and the Ugandan government. 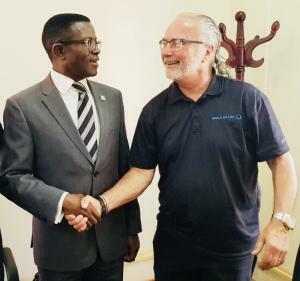 A meeting with The Honorable Charles Peter Mayiga, Prime Minister (Katikiro) of the Buganda Kingdom, solidified an ongoing arrangement with Wells of Life to provide water wells for villagers in the Kingdom of Buganda, the largest traditional kingdom in present day Uganda. During the trip, Wells of Life advisory board member and businessman Rand Sperry arranged for a surprise wedding engagement gift for his daughter, model Keleigh Sperry to actor Miles Teller (Fantastic Four, War Dogs, Bleed for This). Over 400 children and parents gathered at a primary school to celebrate the presentation of the well by performing a play and a special song written for Keleigh. Here's Keleigh's journey to Uganda last spring https://www.youtube.com/watch?v=bPH3RHu4cl8. 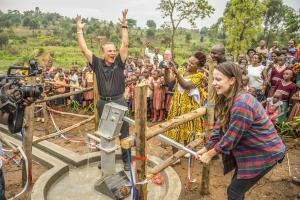 To date, Wells of Life has funded and drilled 376 water wells. The focus for the last two years was in the Mubende and Mitiyana districts of Uganda. Each well provides clean water to 1000 villagers for up to 25 years and organizers aim to fund 1,000 water wells over a ten year period. Wells of Life founder and executive director Nick Jordan and Keleigh Sperry gave emotional testimonies during the meeting with the Prime Minister while Sperry also agreed to become a Wells of Life Ambassador. Wells of Life is based on the premise that water is a basic human right and clean water saves lives. Water wells also relieve the tremendous daily burden on women and girls to collect water. The meeting also solidified the purchase of land for a Wells of Life Training and Visitor Center. Coordinated by Wells of Life Advisory Board Member Fr. Max Ssekiwala, as non-residents cannot purchase land in Uganda, the arrangement includes a 99-year lease with Wells of Life deemed beneficiary of the two-acre site. For more information about Wells of Life, visit www.wellsoflife.org. Founded in 2008, the mission of Wells of Life is based on the belief water is a basic human right and should be available to all people regardless of where they live. Through collaborations with schools, churches and businesses, Wells of Life aims to fund the drilling of 1,000 water wells over a ten-year period serving one million villagers in Uganda. The provision of clean water is viewed as the catalyst to free communities from poverty and progress to sustainable and healthy living.